THE VALUE OF LOVING GOD WITH YOUR MIND What Is Theology & Why Do You Need It? THE HOLY SPIRIT IS THE TRUE NORTH OF OUR COMPASS WHO SPEAKS TO US THROUGH SCRIPTURE. “Behold, you delight in truth in the inward being, and you teach me wisdom in the secret heart.” –Psalm 51: 6 There is so much vying for our attention in this world. Advertising assaults our minds and penetrates our hearts on a daily basis. Pushing messages of who we are, what we’re worth and what we value or aspire to be - messages that can be counter to what God has for us or who he says we are. In the constant stream of social media, I can’t help but find myself easily slipping into a struggle with Instagram envy, Facebook jealousy, Pinterest perfection, and the YouTube vlog world of vicarious living. I know I’m not alone. The truth I know of God, as a child of God, in a relationship with God, under the grace of God and loved by God get’s tested on a regular basis and the Holy Spirit has to remind me what’s important. I need to “delight in truth,” God’s truth, rather than in what meaning I might take away from or have in comparison to the lives of others. constant truth-telling I must speak to my heart to counteract what’s out in the world that’s negative or trying to veer me off of my priority in God’s love and the worship of him and loving service to others. The Holy Spirit is the true north of our compass who speaks to us this truth through Scripture and reminds us who God is and what he came to do (and has done) on earth as Jesus Christ. I’m so grateful for this, because I constantly forget. The Holy Spirit also speaks through other believers too. 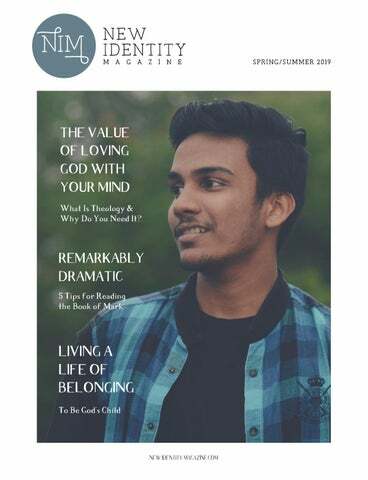 In this issue, Scott Limkeman talks about loving God with your mind. Sean Hughes talks about grasping the epic drama of the book of Mark and what it means for us. Alyssa Rickert talks about belonging to God, being his child and how this changes our outlook. Lastly, Steve Limkeman talks about the show The Good Place and it’s relation to the true “good place” of Heaven. I truly hope you are encouraged by their words. Enjoy! Scripture quotations marked (NIV) are taken from the HOLY BIBLE, NEW INTERNATIONAL VERSION®. NIV®. Copyright© 1973, 1978, 1984 by International Bible Society. Used by permission of Zondervan. All rights reserved. Scripture quotations marked (The Message) are taken from The Message. Copyright 1993, 1994, 1995, 1996, 2000, 2001, 2002. Used by permission of NavPress Publishing Group. Scripture quotations marked (AMP) are taken from the Amplified Bible, Copyright © 1954, 1958, 1962, 1964, 1965, 1987 by The Lockman Foundation. Used by permission. Scripture quotations marked (NLT) are taken from the Holy Bible, New Living Translation, copyright © 1996. Used by permission of Tyndale House Publishers, Inc., Wheaton, Illinois 60189. All rights reserved. Scripture quotations marked (ESV) are from The Holy Bible, English Standard Version® (ESV®), copyright © 2001 by Crossway, a publishing ministry of Good News Publishers. Used by permission. All rights reserved. 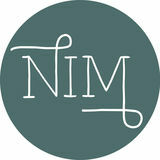 Send letters to the editor via feedback@newidentitymagazine.com or to New Identity Magazine, P.O. Box 1002, Mt. Shasta, CA 96067. Copyright ©2019 by New Identity Magazine. All rights reserved. Reproduction in whole or part without written permission is prohibited. The opinions and views contained in this magazine are those of the author exclusively and do not necessarily reflect the views of the New Identity Magazine organization, staff, volunteers or directors. New Identity Magazine (ISSN 1946-5939, Vol. 11, No. 1) is published quarterly by New Identity Magazine, a 501(c)(3) nonprofit organization, P.O. Box 1002, Mt. Shasta, CA 96067, United States. MISSION Our mission is to provide diverse, Bible centered content to help lead new believers and seekers to a fuller understanding of the Christian faith. VISION GROW Showcasing different Christian perspectives, building a biblical foundation, understanding Christian concepts, jargon, and the practical application of Scripture. CONNECT Encouraging others through testimonies, relationship topics, fellowship, church culture, community, discussions and expressions of faith. LIVE Participating in the world as a Christian, with stories of people actively pursuing God through their passions, organizations and resources. How to apply ones gifts, talents and desires to serve God and others, sharing the love of Christ in everyday arenas. & 4 Why W H ADTo Yo u Need I4 t? THE VALUE OF LOVING GOD WITH YOUR MIND By Scott Limkeman ou are a theologian. That might come as a surprise, but it’s true! Everyone’s a theologian. That’s because everyone has beliefs about God and the world. The word “theology” comes from two words in Greek: theos (God) and logos (word). Theology, like any other “ology”, is simply words about something - in this case God. don’t believe in God - that God doesn’t exist. That’s a theological claim - it’s a statement about God, even if it is expressing a philosophical commitment to his non-existence. You may not engage often in explicitly theological talk beyond that, but it nevertheless reveals theological assumptions that affect in one way or another everything else about your life. you think of “theology.” On a number of occasions, I’ve heard the word “theology” brought up with a kind of populist disdain. It usually goes something like this, whether implicitly or explicitly: Theology is for detached academic people. Christianity is about a relationship, not about theology. Too much theology will kill your faith. It doesn’t matter what’s in your head, it matters what’s in your heart. Theology is so often seen as wet blanket. Christianity is seen as a sort of zero sum game, where you can either have a vibrant and active faith, or you can spend energy and time thinking about theological issues. If zeal for God is like a fire, too much theology can put the fire out. You are a theologian. But why do you need theology - theology that is more than a set of unavoidable, unconscious assumptions about the universe? The answer is tied to your ultimate purpose - to love and worship God. Jesus, quoting Deuteronomy, gives “the greatest commandment” as the call to love God with all your heart, soul, mind and strength. (Deuteronomy 6:4-7, Matthew 22:37-40, Mark 12:30-31, Luke 10:27) The basic point is that we’re made to love God with everything we are. This includes, as Jesus points out, loving God with our minds. If we don’t think well about who God is, who we are, and what the world God made is like, we aren’t loving God with our minds - we aren’t loving God with our whole selves. Others have a slightly more appreciative view of theology, but it’s still seen as an “expert” discipline. Theology is great and all, but it’s something that certain people with degrees do on behalf of the the rest of us. Theology might as well be molecular biology - important for someone to be doing, but largely unnecessary for most people to think about. But, as I hope I’ve made clear at this point, no one can help doing theology. It’s in our design to ask and answer questions about God, ourselves, and the world, so we can’t help wearing our theologian hats on a regular basis - even when we don’t think of it in those terms. It's in our design to ask and answer questions about God, ourselves, and the world. 4 Wo r s h i p p i n g God is certainly more than t r u t h fu l c o n t e n t , but it is also certainly never less than that. graphic designer.) Some Christian circles operate in a climate where the value of sincerity and sentimentality all but eclipses the necessity for truth, but if the goal is to love and worship God as he is, then truth has to be at the heart. Worshipping God is certainly more than truthful content, but it is also certainly never less than that. Thatâ&#x20AC;&#x2122;s why thinking and talking about our theology is so essential. in the pan, or will it be a sustaining fire? Since words about God lead directly to worship, theology is not an academic hobby - itâ&#x20AC;&#x2122;s a life-giving invitation. Scott lives with his wife in Northern California and works at a non-profit ranch for young men in crisis where he farms, directs programming, and disciples the residents. He holds a Masters of Divinity from Westminster Theological Seminary and loves thinking and talking about Scripture, theology, the church, and the culture. He also enjoys nature, food, music, movies, and books. Â© 2017 Twentieth Century Fox Film Corporation. All Rights Reserved. short of the glory of God, and all are justified freely by his grace through the redemption that came by Christ Jesus” (Romans 3:11, 23-24). The reason I’m getting into The Good Place is that it does a brilliant job of challenging our assumptions of what it means to live a moral life in a way that is philosophically fascinating and hilarious. However, the reason I’m getting into the “Good Place” has nothing to do with how many points I earn or lose along the way, nothing to do with how much moral philosophy I cram into my brain nor how good I am at effectively putting it into practice. The Scriptures reveal to me that I’m getting in purely on the basis of grace through faith. And that is the foundation for the hope that I have that I’m getting in at all. After all, when I look deep into my heart, I know that I could never be good enough for the “Good Place” on my own. The Scriptures reveal to me that I'm getting in purely on the basis o f g r a c e t h r o u g h fa i t h . And that is the fo u n d a t i o n fo r t h e hope that I have that I'm getting in at all. Steve Limkeman majored in Philosophy at Westmont College and now teaches Social Studies, Psychology & Ethics at Golden Eagle Charter School in Mt. Shasta, California. He has also taught Chinese history and served as a youth leader for three years in Shanghai. His heroes include C.S. Lewis, Tim Keller, Ravi Zacharias, Christopher Nolan, Denzel Washington and Gandalf the Grey. have a confession. I have a favorite book of the Bible. I know they’re all inspired by God, and they all have authority over my life, but I just can’t help it. Something about the Book of Mark just grabs me in a way no other book does. But if you’re like me, or any Christian for that matter, you probably need some help knowing how to read it. With that said, here are my five tips and pointers on how to read Mark. to gentiles (non-Jewish people). Knowing this, we start to notice one of Mark’s biggest themes: radical inclusivity. Mark is full of stories about Jesus’ love for cripples, the demon-possessed, children, widows, and, of course, foreigners. All these groups of people were at the bottom of the social ladder in Jesus’ day, and Mark’s story completely flips that ladder upsidedown. a disembodied voice from offstage says “You are my dearly loved Son, and you bring me great joy”(Mark 1:11 NLT). Talk about theatrics! Scholars believe that when the book of Mark was first given to church communities, they acted it out. As readers, we need to have the same approach when reading Mark, and that means reading it all the way through in one sitting. Many Christians spend their whole lives only reading passages one chapter at a time. There’s a lot to be gained from reading scripture in small portions, but when reading Mark it’s kind of like watching Star Wars in five minute segments: you won’t pick up on the major themes. So carve out an hour of your time, pour yourself a glass of wine, and read it beginning to end. TIP 3: NOTICE THE WAY JESUS DESCRIBES HIMSELF Mark was a careful author. He believed that Jesus was actually God, the human embodiment of the ultimate ruler of the universe, but in Mark’s story Jesus does not reveal his divinity until the end of Chapter 14. Why would Jesus take so long to tell everyone who he really is? To answer that question we need to take a closer look at the way Mark unveils Jesus’ identity. There’s a lot to be gained fr o m r e a d i n g s c r i p t u r e i n small portions, but when reading Mark it’s kind of like w a t c h i n g S t a r Wa r s i n f i v e minute segments: you won’t pick up on the major themes. 4 By saying "I am," Jesus claimed that he himself is the God that the priests were worshipping their whole lives, the same God who said the words "I am that I am" to Moses through a burning bush in Exodus 3:14.
ultimate claim to cosmic power. Jesus is betrayed by Judas and brought before a council to decide his fate when they ask him ““Are you the Messiah, the Son of the Blessed One?” to which he responds “I am” (14:61-62). To you or me this may sound like a simple statement, but in the context of the first-century Jewish faith (again, the best way to read Mark is to be 2,000 years old), this is the biggest claim Jesus could’ve made. By saying “I am,” Jesus claimed that he himself is the God that these priests were worshipping their whole lives, the same God who said the words “I am that I am” to Moses through a burning bush in Exodus 3:14. So why wait this long to admit his divinity? Think of what it would have been like if Jesus declared his identity from day one. He would have sounded like a political leader or a military commander campaigning for power. If he stormed around Israel broadcasting his name, he would be doing things the flawed, human way. That isn’t true power. It wasn’t until he was on trial for execution, completely emptied of all conventional human power, that he confessed that he was the cosmic ruler of the universe. Jesus, through Mark’s writing, wants us to know that true power doesn’t come from pride or fame, it comes in the midst of humility and trust in God. Even when common sense tells us that all is lost, Jesus is still in control. He is God. broke down the imagined barriers between the two groups. It almost begs the question, what artificial barriers are we living with that Jesus wants us to tear down? As for the second half of Mark, it all revolves around Jerusalem. Spoiler alert: things do not go well in Jerusalem. A typical Jew would expect the Messiah to charge in with massive cosmic powers, kick out the Romans, and finally secure the safety of the Temple. After all, that does sound like something the heroes of the Old Testament would do. But Jesus doesn’t need violence, nor does he need the Temple. Instead, he finds himself betrayed by one of his closest followers and sentenced to death by the very people who expected the Messiah to liberate them! Jesus willingly entered Jerusalem knowing that he was going to be publicly humiliated. He knew he would be killed. Jesus’ time in Jerusalem ends with his crucifixion, which wasn’t just painful, it was horribly shameful. This play starts to look more and more like a tragedy. So much for the Son of God. end of Mark. When Mark was first translated into English, the only manuscripts available contained verses eight through twenty. But now that we have thousands more manuscripts to translate, we can see that the oldest and most accurate ones don’t contain these extra verses. Long story short, Mark didn’t write these words himself. He preferred the more dramatic ending. But why leave the readers with such cliff-hanger? Because we are meant to end the book ourselves. Think about how this ending makes you feel. If you’re compelled by Mark’s story, and you actually believe that the God of the Universe saved of all reality, wouldn’t you want to tell people about it? By ending the book here, Mark essentially put the pen in the reader’s hands and said “you write the next chapter.” Jesus is alive. He is the Messiah. He has come to save all people. So what are we going to do about it? Sean lives in sunny Santa Barbara with his wife Emily and his puppy Poe. By day Sean runs activities at a skilled nursing facility, and by night he is probably asleep. Sean loves talking about theology and biblical scholarship, he can be contacted at sehughes@westmont.edu if you have any questions or comments. “Yes! You’re my daughter and I love you so much!” She smiled, and then she said, “Daddy’s daughter?” “Yes! And he loves you too!” She smiled again. “Do you remember who else’s daughter you are?” “Ummm, Rocky’s daughter?” (Rocky is the dog).
" Fo r y o u a r e a l l s o n s o f G o d t h r o u g h fa i t h i n Christ Jesus" (Galatians 3:26). Fo r e v e r y n e g a t i v e t r a i t t h a t I pass down, God will be able to help her overcome it and p u t o n a n e w c h a ra c t e r .
relationship made possible. Everyone around him benefitted from it. This is why I insist on confusing my daughter by telling her that she is God’s daughter every single it comes up. I love that she belongs to me. I love that she has my eyes and her dad’s hair. I love that she falls asleep safe and secure knowing that she belongs to me and I belong to her. But even with that, I want her to know that she belongs to someone who can give her a far greater identity than I can. Yes she’s my daughter, but also she’s the daughter of the King! In every way that I will hurt her, God will be able to heal her. For every negative trait that I pass down, God will be able to help her overcome it and put on a new character. And when I eventually leave her and go join him and my own earthly father, God will still be there with her in exactly the same way he was before. Alyssa Rickert lives in Mt. Shasta, California with her family. She earned her Masters in Counseling from Denver Seminary and enjoys using her education to be a support to others. You can usually find her outside playing with her kids.